Alien-invasion post-apocalyptic TV drama Falling Skies concluded its third season run in the UK (on cable station FOX) on 21 September 2013. Earlier in the summer, US cable company TNT confirmed that it had commissioned a 12-episode fourth season of the show, which would begin transmission in the summer of 2014. The second series of US post-apocalyptic blackout drama Revolution premieres in the UK at 22:00 on Sunday 16 October on Sky 1 and Sky 1 HD, continuing weekly on Sunday evenings. Season two has been commissioned as a full 22-episode run (in contrast to the original 10-episode commission for season one – which was later extended to 20 episodes part-way through the run). Revolution‘s second series began transmission in the US on 25 September. Revolution is an epic, swashbuckling drama from J.J. Abrams’ Bad Robot Productions and Supernatural creator Eric Kripke. With sweeping scope and intimate focus, this show centers on the Matheson family’s struggle to survive 15 years after a mysterious worldwide blackout. Their post-apocalyptic world is juxtaposed with bucolic, overgrown cities and a journey of hope, rebirth and retribution. Season 2 picks up right where Season 1 left off with ICBMs speeding toward Atlanta and Philadelphia. Last season, Rachel’s (Elizabeth Mitchell, Lost) relentless quest to avenge her son’s death sent her on a heroic journey to The Tower, where she could turn the power back on, so the Rebels and Georgians could wage war against General Sebastian Monroe (David Lyons, ER) and defeat his treacherous Militia. Aaron Pittman (Zak Orth, Romeo + Juliet), a major player at Google, joined her on this suicide mission with the hope of restoring the world’s technology. Miles (Billy Burke, The Twilight Saga) discovered that Monroe was waiting at The Tower for Rachel and mounted a rescue mission with Charlie (Tracy Spiridakos, Being Human [US]), Tom Neville (Giancarlo Esposito, Breaking Bad), Jason Neville (JD Pardo, The Cinderella Story) and Nora (Daniella Alonso, My Generation). But our heroes soon discovered that former Department of Defense Secretary Randall Flynn (Colm Feore, The Borgias) had outwitted Monroe and hijacked The Tower for a sinister “Patriot” scheme. With help from a very reluctant Aaron, Randall turned the power back on and used the surge to send nuclear bombs to the Eastern seaboard. This season, Revolution returns to its powerless roots and settles into Willoughby – a small town in the great nation of Texas. We flash forward three months to find Miles, Rachel and Aaron licking their wounds and lying low, aided by the town doctor, Gene Porter (Stephen Collins, 7th Heaven). Charlie sets off on a vision quest in the Plains Nation and a desperate Neville and Jason search a Georgian refugee camp for their beloved Julia. Though our heroes are scattered around the continent, one thing is clear: that harrowing trip to The Tower created some peculiar circumstances and altered the political landscape of the continent. Season four of post-apocalyptic zombie TV series The Walking Dead premieres (in the UK) on cable station FOX on 18 October 2013 at 22:00, continuing weekly thereafter. At the end of last season, you were left nailed to the edge of your seats as you witnessed The Governor and his mercenaries storm the prison, hoping to take down Rick and the survivors once and for all. Meanwhile, Andrea paid the ultimate price for betraying The Governor and met her grisly end. Series one and two of Survivors are now available for streaming download on the Hulu service (only currently available in the US). 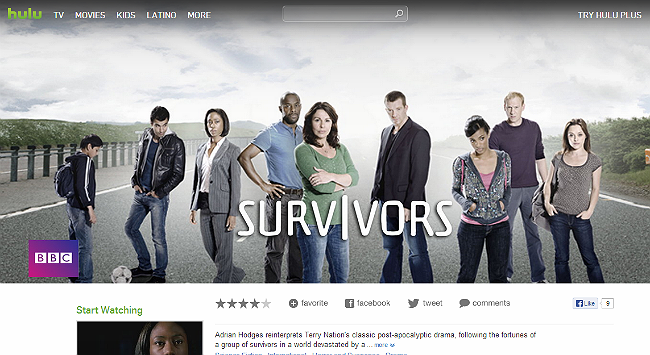 Hulu is an alternative and competitor to the Netflix service (which also offers Survivors for online streaming). Until 17 October 2013, all six episodes of series one are available free (to US residents registering to use the service).